Schools are getting better at fostering a friendly environment for LGBT students, but they still have a long way to go. A survey released Wednesday by the Gay, Lesbian & Straight Education Network, which advocates school safety for students, regardless of sexual orientation or gender expression, showed notable improvement for LGBT students during the 2012-2013 school year from 2010-2011. But huge numbers of LGBT students reported problems at school. Of the nearly 8,000 students ages 13 to 21 who were surveyed, more than 55 percent reported feeling unsafe at school due to their sexual orientation, down from 64 percent in 2011. Thirty-six percent faced physical harassment, including pushing or shoving, a drop of 2 percentage points from the earlier survey. And more than 16 percent said they were physically assaulted, sometimes with a weapon, a decline of 2 percentage points. Many students said they avoided places at school that made them feel unsafe. “You see tremendous progress since 2011,” Eliza Byard, executive director of Gay, Lesbian & Straight Education Network, told The Huffington Post. “That being said, it still means far too many students are experiencing anti-LGBT violence and discrimination." The survey found that certain school policies contribute to discrimination. 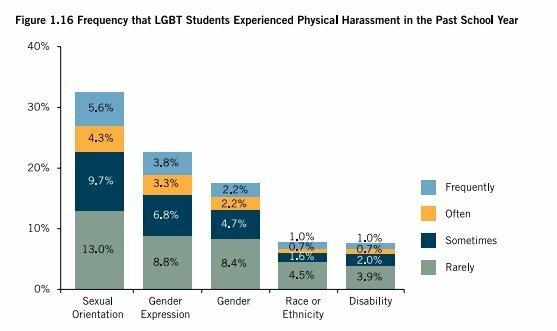 More than half of students who were surveyed reported hearing teachers or school staff make homophobic remarks against LGBT students. Further, school staff often fail to protect LGBT students, the survey showed. The number of students who said school staff members intervened to stop bullying was unchanged from 2011. Byard said the new report provides greater detail than earlier surveys on how schools discriminate against LGBT students. For example, nearly 18 percent of students reported being prevented by from “discussing or writing about LGBT topics in school assignments.” Nearly 16 percent were prohibited from wearing clothing or items supporting LGBT issues. For the first time, the survey asked students whether they had heard negative remarks about transgender people. Byard said she worries that school structures and policies are not keeping pace with changes in student behavior. “In our current political climate, that makes me really worried,” Byard said.